The Gents' 'Pulsynetic' Waiting Train Electric Turret Clock Movement. An accessible, illustrated guide to the Gents' Pulsynetic, Waiting Train, electrically driven, pendulum, turret clock movement and associated impulse clock system components. Information only has value if it is shared freely. Only a miser keeps his wealth in a vault. Images of Gents' Waiting Train movements and system components are always very welcome at: chris.b at smilemail.dk. The earliest, 2008 posts run chronologically. Later posts run backwards. Thanks to a tip from a new contact I have discovered some excellent images of the G&J WT installation at Bournville School in Birmingham. The clock and striking gear are part of the carillon. Which is a hand struck, mechanical lever and wire system for playing bells. The Bournville carillon is well featured on YouTube. Here are only a couple of examples. Sadly I have not found any videos of the clock system so far. Here are my sources for the excellent illustrations from a newspaper article on the Bournville clock system and carillon. There is even a website for the Carillon. This is the third G&J Waiting Train movement which I have illustrated on my blog and all are completely different from each other. Suggesting, perhaps, that each new commission was treated as an individual project based on G&J's long expertise with clocks and bells. The spotless living conditions for the movement and striking/chiming work are obvious. Keeping maintenance through wear and tear to a minimum. All too many turret clocks and bell tolling mechanisms live in absolute squalor. The glass case keeps curious fingers and dirt well away from the WT [Waiting Train] movement. It utilizes the familiar Hipp toggle and V-block pendulum maintenance. With its ability to draw more driving power simply by shortening the period between pendulum impulses. In this case the pendulum is driven from below the bob by a pair of electromagnets. Their considerable offset means that the pendulum is driven at near the extremes of its swing. [arc] Thus any energy applied at this point has maximum effect. This impulse timing is normally avoided with precision clocks but the WT is immune to timekeeping errors. Since it is always under the control of an associated, precision, master clock. Interestingly, there is a small mercury switch to the left of what I had first assumed to be the the Hipp contacts. Perhaps the mercury switch provides the contact when tipped by the Hipp toggle mechanism? The rest of the WT mechanism is typically [visually] complex, for G&J, and full of hidden mysteries. I am guessing that the train of three round objects on the right is tied to the electrical release of the chimes and hourly strike. The top wheel is marked in hours. While the second wheel has four studs. Suggesting chiming of the quarters? No electrical wiring is directly associated with the "quarters" wheel. Though there are several levers which could be actuated by the four studs on the face [and possibly the rear] of this wheel. While the lowest circular device is clearly wired and carries a mercury switch. The oblique view helps to show much more detail not visible in the "straight on" image. Three brass levers [or contact bars] on the rim of the lower wheel pointing upwards at the central "quarters" wheel. I would suggest that the lower wheel rocks rather than rotates. The pendulum drives a ratchet wheel via a ramp and counterbalanced, actuating lever near the top. The ratchet wheel drives a worm which, in turn, drives a complex bevel gear system to the three wheels below, on the right. There is a strong suggestion of a differential, bevel gear system being involved at the top right of the pendulum. Why else have two bevel gears facing each other on either side of the inner bevel wheel? Striking is typically managed by an electric motor driving a large, snail cam to lift and drop a lever. 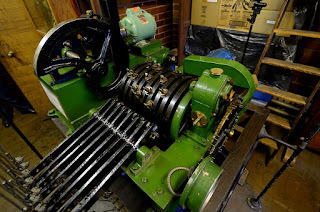 This part of the mechanism is arranged on the left of the chiming gear nearest the WT movement. Though only electrical contact is required between the two. There appears to be count wheel striking, with an associated, large ratchet wheel on the left of snail cam. So the number of blows [hours] of the strike is controlled by the count wheel. Just as it does in many common, 30-hour, long case clocks and others. 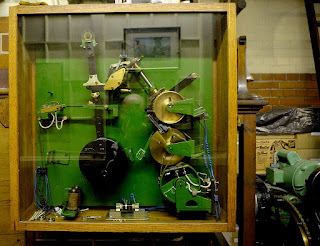 There is a very long history of countwheel striking on turret clocks. The obviously high quality, chiming mechanism is rather like an overgrown music box in action. 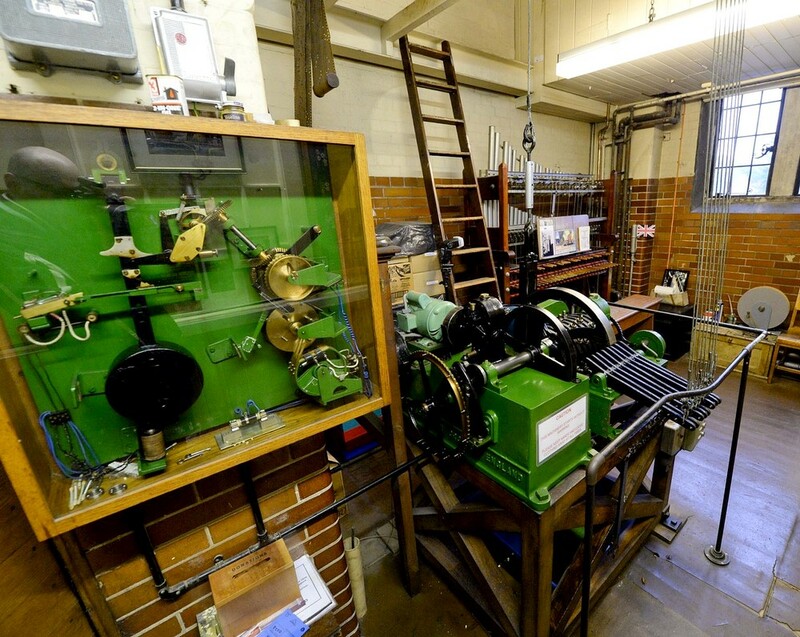 Except that the usual musical 'comb' is replaced by sturdy levers leading to actuating cables to each overhead bell. The timing of the individual bells can be individually adjusted [if necessary] by moving the let-off studs around the drum. Handy, should the studs wear over a long period. Which would alter the exact timing of lift and release. Making the timing of the "tune" sound slightly wrong.